Sixteen acts battled it out tonight for a chance to represent Malta in Kyiv this May. 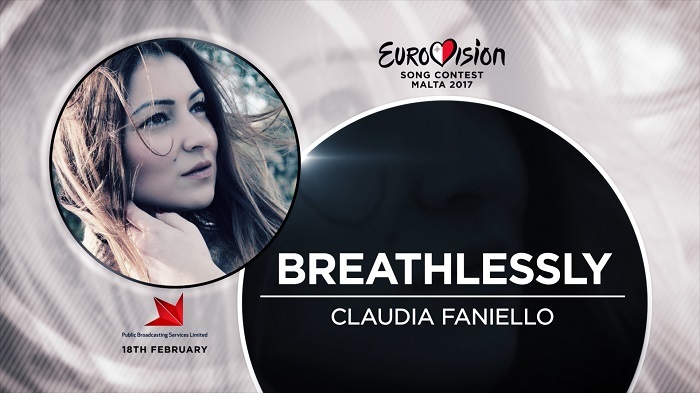 In the end, the 2017 Malta Eurovision Song Contest was won by Claudia Faniello and her entry Breathlessly, who managed to get the highest share of the Maltese televoting. Indeed, as opposed to previous years, the 2017 Maltese result was determined solely by televoting. Klinsmann Coleiro is a self-confessed Eurovision fan. 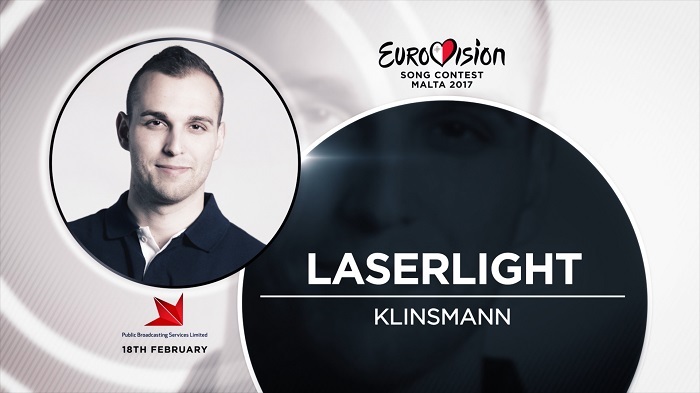 He first participated in the Maltese Eurovision selection back in 2007 when, aged just sixteen, he attained a third place. Rhythmic Laserlight begins sounding like an acoustic number, with guitar-strumming and a piano. The tempo rises in time for the first chorus when the song turns into a fun ‘bouncy’ song. The presentation came complete with a loose, energetic choreography as four dancers, two female and two male, joined Klinsmann onstage. The singer himself looked very relaxed and happy onstage. Raquela has participated in the Maltese selection twice in the past, in 2009 and 2011. Ray of Light is an effective acoustic ballad whose chorus is carried beautifully by the singer. 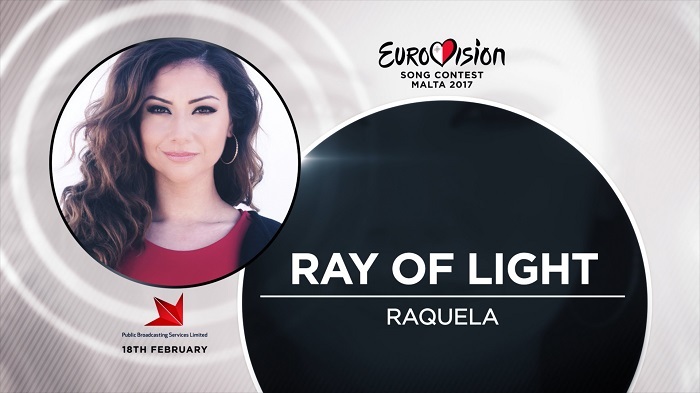 Indeed, the song reveals Raquela’s strong vocal ability. Raquela appeared alone onstage in her floral gown. The performance went smoothly enough. A strong vocal performance, the singer appeared a tad too serious perhaps though there was the occasional smile. 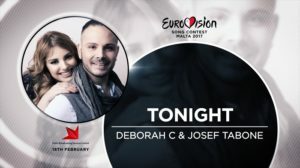 It appears that, between them, Eurovision fans Deborah and Josef can count eight participations in the national selection stage of the contest. They have been working on Tonight, a sweet, happy song with a characteristic string strumming, since June. This was a fun performance with multi-coloured flowers shown on the backdrop. Both Deborah and Josef interacted a lot and looking very happy onstage. Kevin won the fifth series of the Swedish Pop Idol. 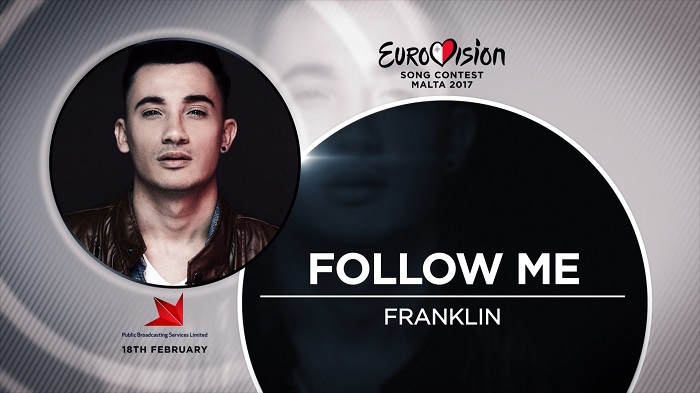 He was also the runner-up of the 2013 Maltese selection with the entry Needing You and was also a collaborator on one of the entries in the Romanian selection the same year. Follow is a mid-tempo song with an ample musical production. Kevin’s voice sounded perhaps a bit thinner than in the recorded version of the song. He also seemed a bit too concentrated on his vocal performance, which made his face look somewhat strained. Still, overall not a bad presentation. Jade’s previous Eurovision experience includes taking part as a backing vocalist and dancer in 2006’s Junior version of the contest. 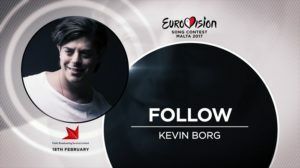 Seconds Away is co-written by fellow contestant Kevin Borg (see above) and described as ‘an avant-garde, current, up tempo R’n’B song with Eurovision influences.’ The song definitely has a sharp musical production and is sung with gusto by the young singer. The live presentation saw the singer surrounded by three male dancers and was quite energetic even though the vocal performance was not always pitch-perfect. 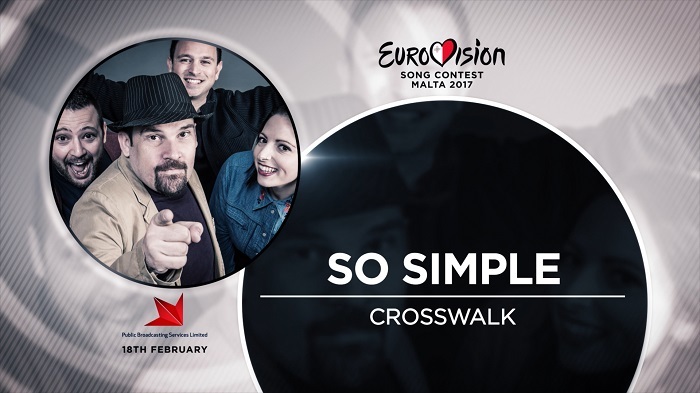 Crosswalk, one of Malta’s most sought-after wedding bands apparently, has never participated as a group in the Maltese selection before. However, lead singer Janice has entered on her own in 2013. What is more, guitarist Kenny supported Malta’s 2013 entry Tomorrow playing the Ukulele. So Simple, a sweet (you can rely on Malta for sweetness as most Eurovision fans know) song with strong country influences and an acoustic, ‘live’ feel to it. It matches Janice’s voice beautifully. There were multi-coloured geometric forms shown on the backdrop and the group’s live performance went problem-free. 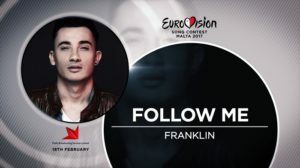 Franklin is a regular singer at popular Maltese show Hadd Ghalik! Follow Me is a poignant pop ballad that suits the singer’s vocal ability and sentiment of delivery. Franklin’s presentation started and finished in black and white. The impression of rain was very effective at the beginning. Franklin’s vocal performance, though hitting high notes very bravely, felt a little strained at times. Rhiannon is also a songwriter and composer and has taken part in numerous local and foreign festivals. 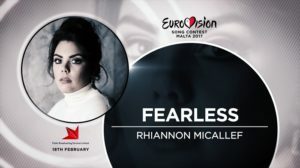 Co-written by Rhiannon, Fearless starts as a ballad before revealing itself as a fresh R’n’B number with a bold musical arrangement and expressively delivered by the singer’s characteristic voice. The singer, in a dark blue gown, was joined on stage by three female dancers performing around her. With a demanding song, her live vocal performance was good though some hoarseness could be detected here and there. One of Miriana’s earliest memories is apparently singing 2002 Maltese entry 7th Wonder. Miriana has since participated in a number of local and international festivals, including the Sanremo Junior finals. 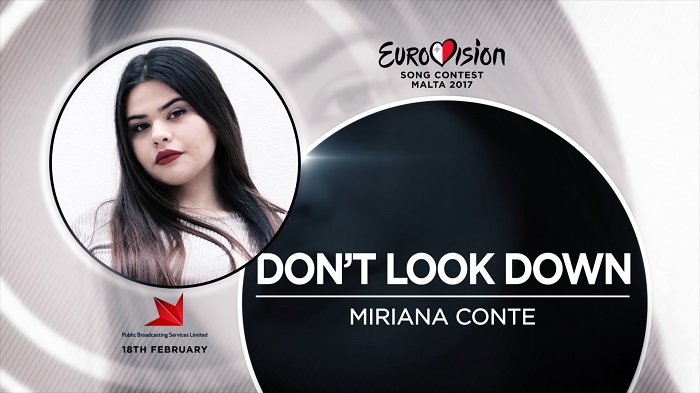 The message of Don’t Look Down is based on Miriana’s own experience of overcoming being bullied at school. Don’t Look Down is a rhythmic song with a definite reggae feel to it. Shauna is an animal care student as well as an activist for animal welfare. Crazy Games is a radio friendly, electronic pop song. Again, there is an attractive musical production going on with the song. There was attitude with the live performance of this one, which came with an energetic group of dancers. Shauna played confidently for the camera with her girls. Janice’s past involvement with the Malta Eurovision Song Contest includes being a backing vocalist for Kevin Borg’s runner-up entry Needing You. 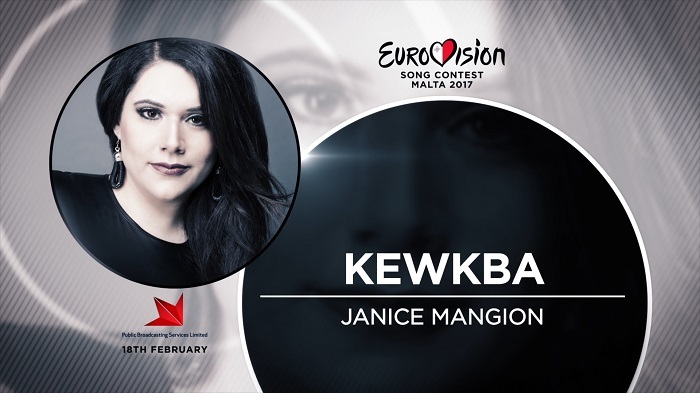 Kewkba is the only entry in this year’s Maltese selection sung in Maltese. It is a typical ballad with long musical phrases that the artist sings with passion. 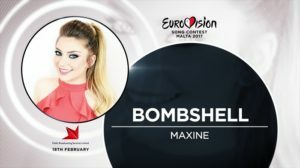 The last time that the country was represented in Maltese was back in 1972 when it unfortunately finished in last place (see the ‘Malta in the Eurovision Song Contest’ section below). Could Janice be the entrant to prove that the country could do well singing in its native tongue? In her black frock and alone on stage, Janice gave an exceptional vocal performances that received a warm round of applause. 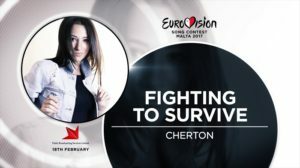 Cherton, an estate agent by day, is also passionate about music and a resident singer of Maltese TV panel show Xarabank. 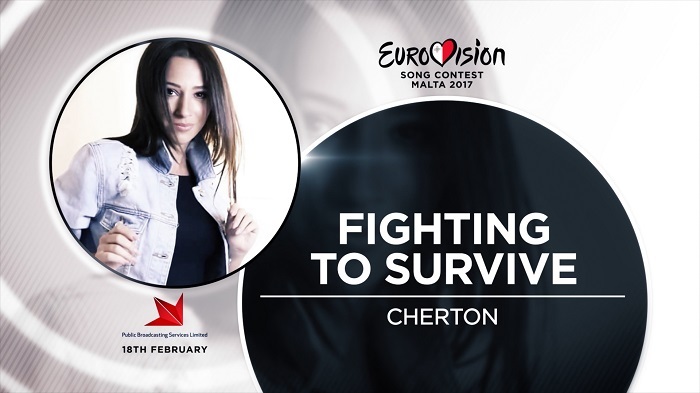 Fighting to Survive is an empowering, pleasant R’n’B number that suits Cherton’s voice. Wearing a swimsuit-type black sequined number, her hair tied back in a pony-tail, Cherton cut a striking figure. She looked in control onstage. Her voice struggled a bit with the high notes towards the end but a confident performance overall. Maxine, who is also an actress, participated in the 2009 and 2010 Malta Junior Eurovision Song Contests. Two years ago, she was a finalist in the Malta Eurovision Song Contest proper with her song Young Love. True to its title, Bombshell starts full of attitude with sharp percussions before settling for a somewhat more conventional ‘Boom boom boom, like a bombshell’ chorus lyric. A fun, pop song. Maxine was joined by four female dancers onstage. The set was lit in bold red, blue and white. The performance could still have had a little more oomph perhaps though the singer was quite relaxed and managed to hit all the high notes. 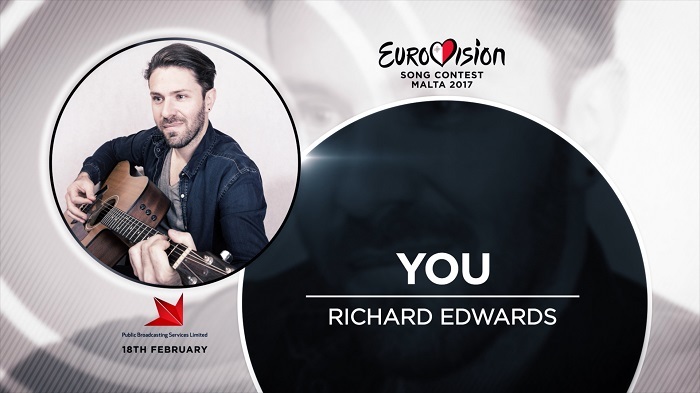 As lead singer of group Firelight, Richard represented Malta in the Eurovision Song Contest 2014 with the entry Coming Home. The song qualified from the semi-final stage, finishing in 23rd place in the final that year. You starts pretty much as an acoustic ballad with some stringed accompaniment. There is something distinctively Irish about the song. Halfway through, the entry livens up to a more conventionally pop sound. Richard’s voice sounds noticeably more mature in You compared to him back in 2014. On a blue-lit stage, Richard started a bit unsure vocally. There were two large twin-images of the singer in the background and, in fact, the performance seemed to build as it progressed. 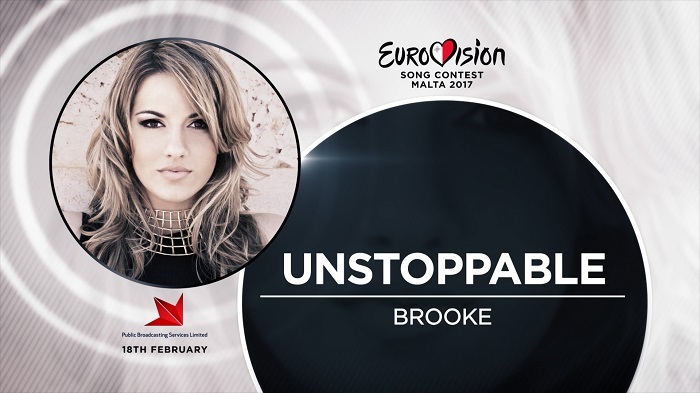 Brook came second in last year’s Malta Eurovision Song Contest with her song Golden. As a singer, she has supported, amongst other artists, Taio Cruz, Eurovision 2012 winner Loreen and Laura Pausini. Unstoppable is an electronic dance track. Dressed in a black sequined see-through gown and wearing a headdress a-la Georgia 2015, Brook looked very confident. Being picky, there was some strain when it came to the high notes again but this was an overall strong performance that got a warm reception from the audience. Claudia has had past Eurovision experience, having accompanied the 2004 entrants Julie & Ludwig as well as her brother, 2001 and 2006 Maltese entrant Fabrizio Faniello. Claudia has also participated in past Eurovision selections of the country. In 2008, with two entries in the competition, she finished in second and third place. The singer also attained a fourth place in 2009, an eighth place in 2010 and a ninth place in 2011. In 2012, Claudia was back in the top 3 of the Maltese selection, finishing in second place with Pure. Breathlessly is a slow ballad that starts to piano accompaniment and builds up to a cinematic type of number. It was a white gown we had this time and a stage romantically lit in blues. Like Brooke before, Claudia was alone on the stage. A good vocal performance and an overall polished live performance. It went down well with the audience. Kevin Borg with Follow was second runner-up. He was presented his award by Chiara. Janice Mangion with Kewkba was first runner-up. Ira Losco did the honours of presenting her award. It was down to Mary Spiteri to present the first award to the winner of the night, Claudia Faniello with Breathlessly. The show started with the candidate acts performing in turn a medley of past Maltese Eurovision entries. The presenters were popular actor Daniel Azzopardi and cancer survivor, glamorous Charlene Mercieca. Guest performers included Junior Eurovision 2016 Maltese entrant Christina Magrin. 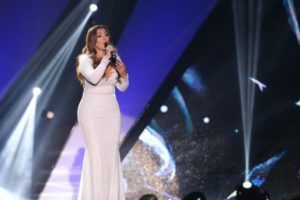 Much anticipated Ira Losco sang Invincible as well as last year’s Maltese entry Walk On Water, complete with some of the backdrop imagery that had been used in Stockholm. Losco also performed her latest single We Are The Soldiers, a clue to which had been the epaulet, military-inspired jacket she was wearing tonight. It was a Eurovision rocky start for Malta starting with two consecutive last place results in 1971 and 1972. The country subsequently withdrew from the contest, with a single 1975 participation between 1972 and 1991. In 1991, Malta was back for good however. Singing in English (the 1971 and 1972 entries had been sung in Maltese), the country finished a respectable sixth. There followed a really succesful string of top 10 results between 1991 and 1997, with two third place results in 1992 with Mary Spiteri’s Little Child and 1998 with Chiara and The One That I Love. In 1999, countries were allowed to sing in whatever language they opted for and not in one of their official languages. Malta had thus lost the privilege of being one of the few countries (along with the United Kingdom and Ireland) that could sing in English, the language most widely understood around the world. 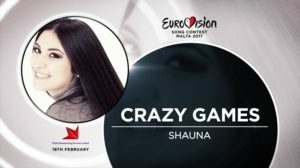 In retrospect, it is indeed difficult to deny that singing in English did not give a boost to Eurovision entries and Malta’s case is indicative. 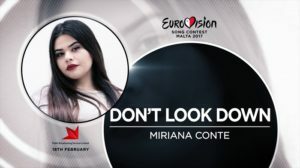 Malta found itself with another last place result in 2006 (the third one in the country’s Eurovision history to date) and Maltese top 10 occurrences were not to be expected as a more or less given. 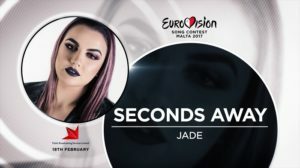 However, in the same period the island nation still attained its best results so far – two second places in 2002 with Ira Losco’s 7th Wonder and in 2005 with Chiara again and Angel. The country also has 50% qualification rate to the final since the introduction of the current semi-final round system in 2007. Last year, a returning Ira Losco managed to qualify from the semi-final round with her entry Walk On Water and attained a respectable 12th place in the final. Could Claudia Faniello improve on Ira Losco’s 12th place last year? In the videos below, you can watch Claudia’s winning performance of Breahlessly from tonight as well as Ira Losco performing Walk On Water last year in Stockholm.